The beautiful snow from last night kept falling. We woke up to 6" which needed to be shoveled etc. This year we have a plow service for the drive, so that was clear. 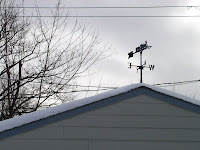 This is our railroad weathervane on top of the garage. The wind blows some of the snow off the garage. I finished a Fidget for DDIL Peg. It just needs buttons, wh ich I will get at work when I go on Friday. 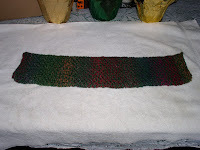 I used two yarns., Noro Cash Island (a gift from a local yarn store) and a Nathersgarn Wool which I inherited from my mother. Both were stash yarns. I started some toe up socks from the Ravelry Sock Knitters Anonymous group. They're the September Mystery socks. I have clue one finished on one sock and have started the second.